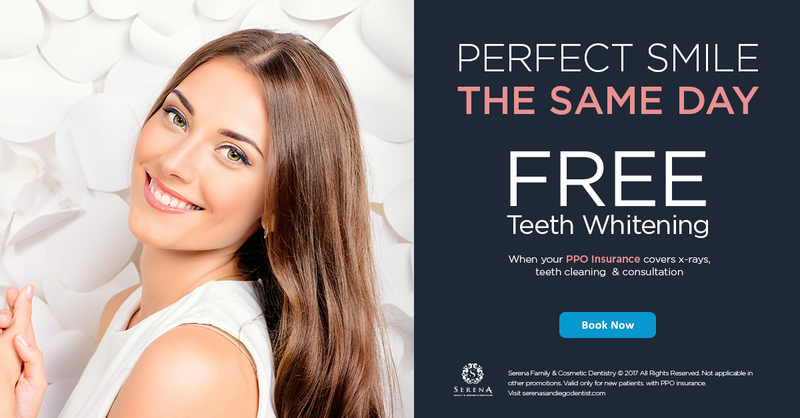 Starting today and ending on December 30th, Serena Family & Cosmetic Dentistry in Clairemont, San Diego CA, will offer FREE teeth whitening when coming for a consultation, x rays and teeth cleaning if you have a PPO Insurance plan. We want to help you end the year in the best way possible and make those end of the year pictures are something you’ll cherish for years to come. We want to help you look your best in every special moment. How does PPO Insurance work? At Serena Family & Cosmetic Dentistry, we accept most PPO dental insurance plans. We will be more than happy to submit all insurance forms for you and help you recover the most from your dental problem. If you have insurance, we will be happy to assist you in checking your insurance coverage and eligibility so we can properly inform you on the types of procedures your insurance plan covers you. Please be aware that you are responsible for whatever portion your dental insurance does not pay. Your monthly statement will reflect the total amount due, and you are required to pay the balance within 90 days. Please contact us with any dental insurance questions you may have and to verify coverage. Please provide your insurance information at the front desk, so we can properly process your insurance claim, or you can call us provide your insurance information and at the same time set up an appointment. During which our friendly staff will process your coverage and eligibility with your current insurance provider and call back to provide your benefits, or we can inform you directly at the office. 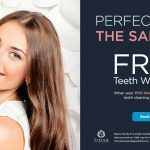 Get the dramatic result you’re looking for with in-office and at-home teeth whitening options in Clairemont, San Diego CA. with Serena Family & Cosmetic Dentistry. Teeth Whitening is a bleaching procedure popularly applied throughout the nation and around the globe to lighten stained teeth, and now you too can get the benefits of this procedure most affordable and easy. If you have any doubts, you can chat with us or send us an email.